All Woo-Commerce Themes come with some pre-designed pages that unfortunately don’t leave users with much wiggle space for customization. 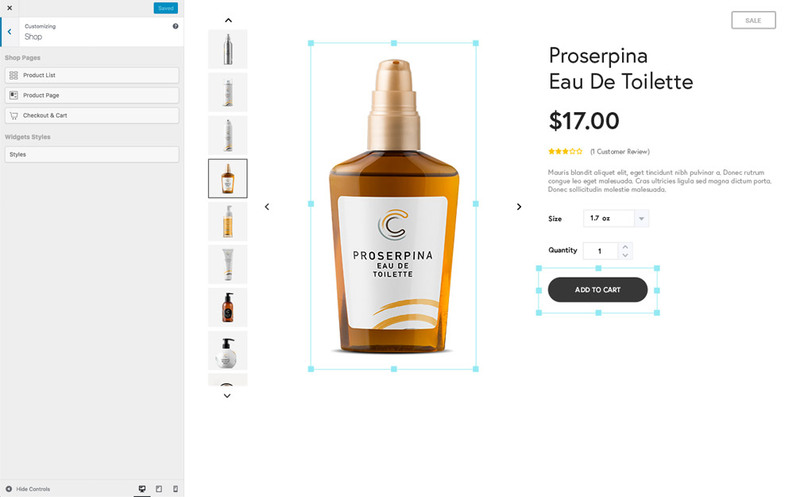 Jupiter wants to open a whole big playhouse of e-commerce customizations for our users by offering a powerful Shop Customizer that empowers you to choose the exact look of your e-commerce website—all with a WYSIWYG editor! See all of your changes applied at the same time whenever you edit font faces, colors, layouts, images, icons, and more! Different Designs for Phones & Tablets. Offer your customers an online shopping experience that’s easy to follow regardless of whether they’re using their mobile, desktop or tablet! Make your Shop Widgets match your brand and color palette, all with an easy-to-use Visual Editor. Take control over every single item listed in your product information and choose what you want to be displayed to customers. Launch your online shop today by picking from a collection of beautifully designed product pages that are 100% customizable. Import your already built Woo-Commerce Shop to Jupiter and customize your online shop even more! Shop Customizer & Woo-Commerce now work together, hand in hand!